I was driving around "Vicky Point" looking for a new café to try when my sister shouted, "Stop!" I stopped dead (fortunately nothing was behind me) wondering what was wrong. 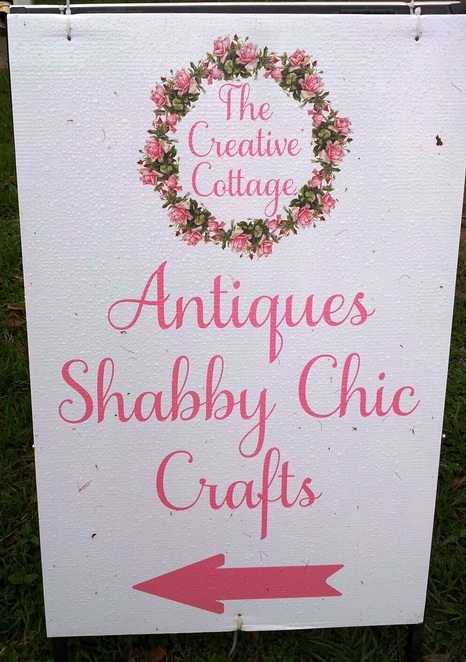 "I just saw a sign for Shabby Chic," she said. "Can we go and check it out?" Of course the answer was "of course." 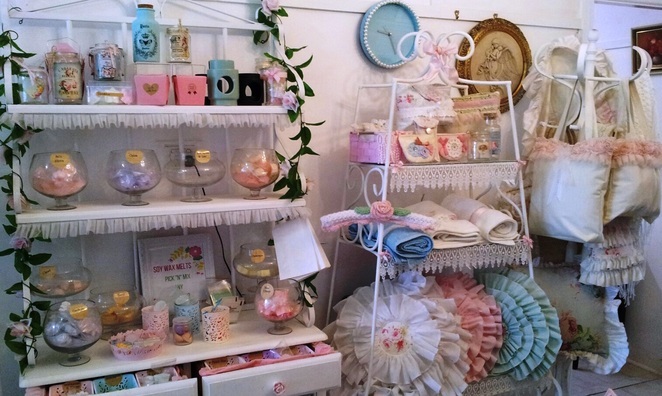 We both love retro, vintage and handmade. The Shabby Chic Sign that Stopped the Sisters. The Creative Cottage is literally a cute old cottage, given a new lease of life, like much of its wares. 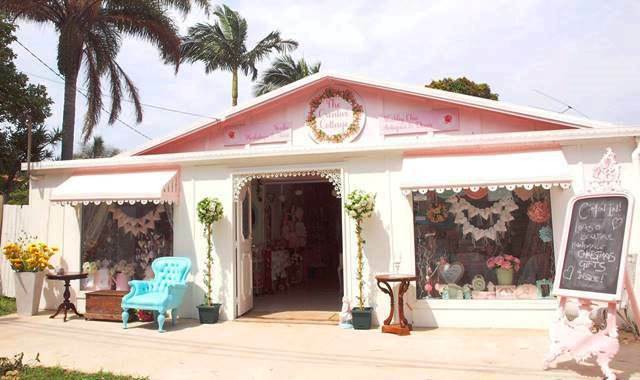 It is the sweetest shop from the outside with baby pink awnings and bunting in the window. I am a sucker for bunting. I think a party without bunting is just a meeting. My nickname should be Bunty. 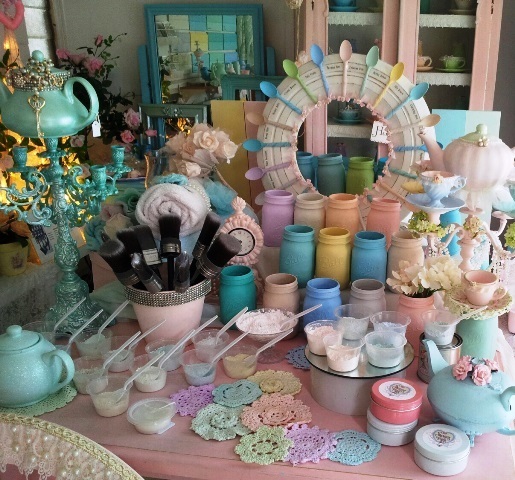 The shop is even better inside with its gelato-coloured décor. It is deceptively large with Tardis proportions. There are 4 separate rooms - all overflowing with treasures, trinkets and gorgeous goodies.The citrusy lime candle melts are to die for. We bought all that were left in the shop. The delightful proprietor, Bea Hare, was friendly and very helpful. She told us that her philosophy is: "Happy House, Happy Home". 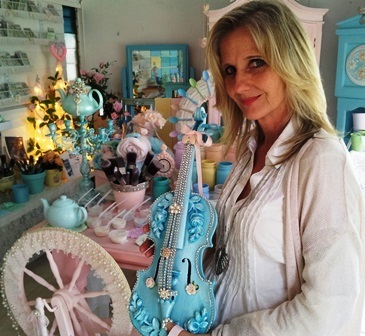 She said that she has always been creative and that she established Sugar Paint in 2012. 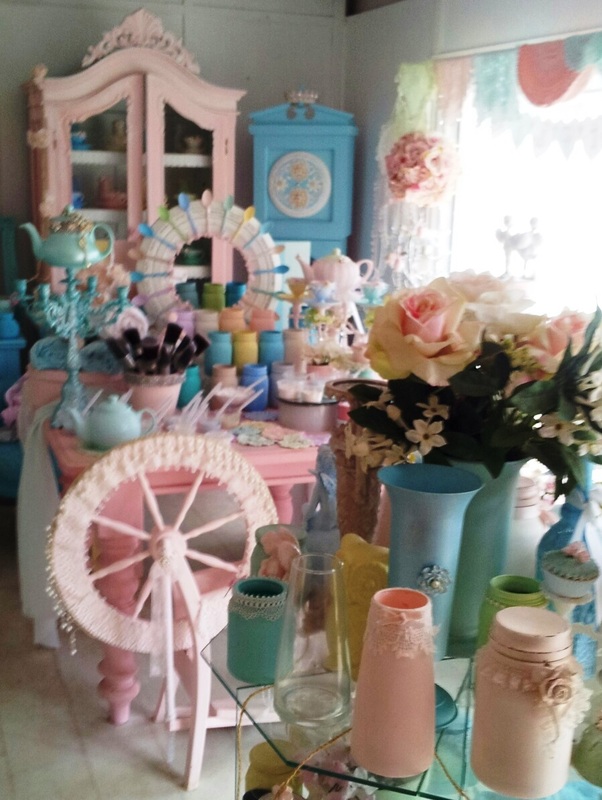 Luv My Stuff creates totally unique shabby chic furniture and decor using Sugar Paint. These items are all handmade and are unique. You won't find anything like them elsewhere. 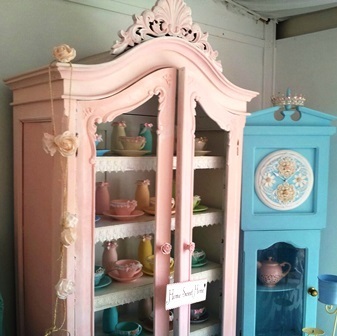 From Armoires to Beads to Clocks to a Violin. Shabbilicious! 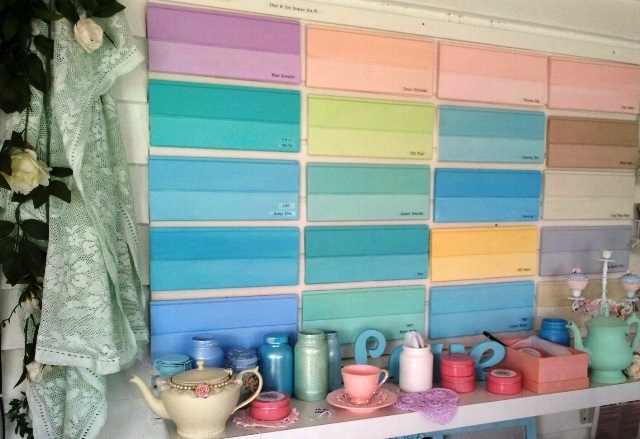 Sugar Paint is a patented, innovative and new way to paint furniture, decor items and even dye fabrics. It is extremely cost-effective and puts you (the creator) back in charge. 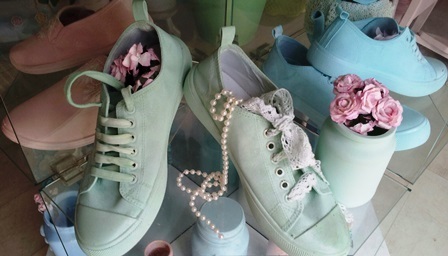 It even works on fabrics - check out the sneakers and crocheted doilies in the shop. Sugar Paint Classes run every two weeks and I can't wait to do one. Bea promises that we will learn how to create in a brand new way in beautiful colours. 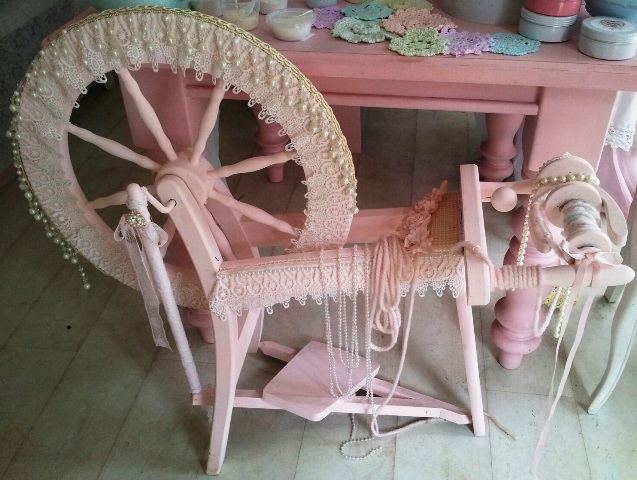 The hands-on workshop is conducted at the Creative Cottage premises and costs a very reasonable $99 per person. It includes full instructions on the use and creating with Sugar Paints. The course duration is three hours and all materials, paint, a sample project and refreshments are all included. 1. Choose a standard base paint of your choice. 2. You can use a paint and prime base coat. 3. Add chalk additive if you want a chalky finish. 4. Add silk finish if you want a silky smooth finish. 5. Add textured finish if you want a textured finish (of course). 6. Add milky finish if desired. 7. Add Sugar Paint powder. If you would like to dye fabrics to your desired colour, just mix the powder with warm water. Easy. You can also find jewellery and clothing in-store - both new and pre-loved. Bea had a special consignment of new T-shirts from her friend's company and was selling them off for only $5 each. I bought up big for myself and for Chrissy pressies. 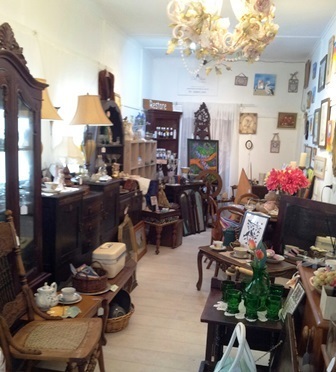 The room full of antiques is a veritable Aladdin's Cave and you never know what you might discover there. I found a beaded hair comb and my sister picked up the sweetest pair of sunnies. I hope you enjoy the hunt as much as we did. Images by May Cross . What a gorgeous outlet, May - a true little gem! I too have been to this wonderful place (& found by accident!) The owner is sweet & her prices are really good. I told my sister in law about it and she has visited also. Can't wait to try a class!